Kolkata Knight Riders have been massively benefited by the brilliant pair of Chris Lynn and Sunil Narine at the top. Yet, the duo hasn't been as effective in this season of the IPL primarily due to teams working them over individually. Chris Lynn, though, seems to be on his way to finding lost form. On Sunday, he flayed the CSK attack with a well-made 82 in 51 balls to make his third forty-plus score in four matches. The Australian had started the season with scores of 7, 10 and 20 before recovering to record 43, 50, 0 and 82 in his last four matches. Lynn was on song from the word go at Eden Gardens on Sunday. He utilised the field restrictions in the powerplay overs to peg Chennai onto the back foot. 38 of the 49 runs scored in the first six overs came from Lynn. In the process, he targeted CSK's weapon in the first six overs, Deepak Chahar, and pushed him out of the attack. The ploy to attack Chahar worked fine as CSK were forced to take up an over of Jadeja in the first six. 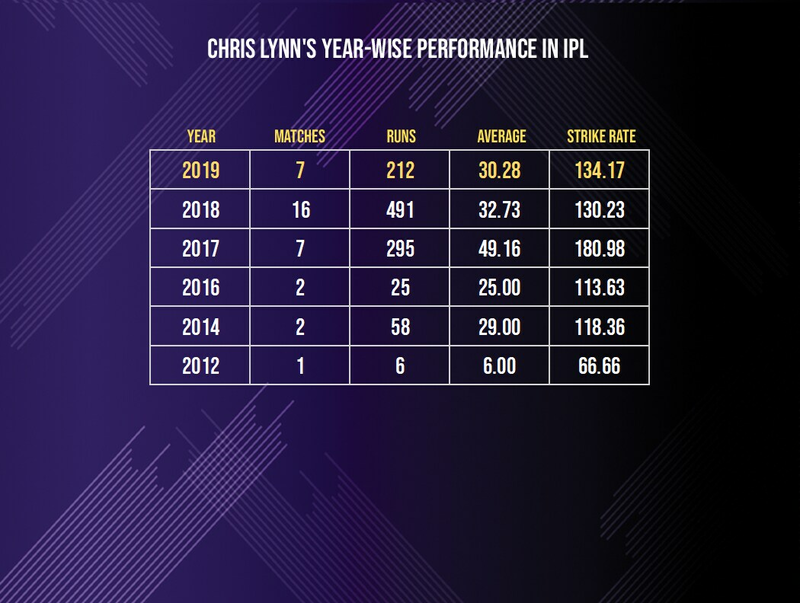 Lynn has had a decent outing in this year’s IPL, making 212 runs at an average of 30.28. In the same number of matches in 2017, though, Lynn had made 295 runs at a brilliant strike rate of 180.98. But teams have worked through his concerns with spin in the last couple of seasons and the average has dipped. This season, he has fallen to spin in four of the seven matches with leg-spinners and left-arm spinners dismissing him twice each. The strike rate has increased from 130.23 last year to 134.17 this year but it's still far off from his own numbers in 2017. With this knock, Lynn has also entered into the 1000-run club for Kolkata Knight Riders. He is their seventh highest run-scorer with 1081 runs in 34 matches and is even above Sourav Ganguly in the list. 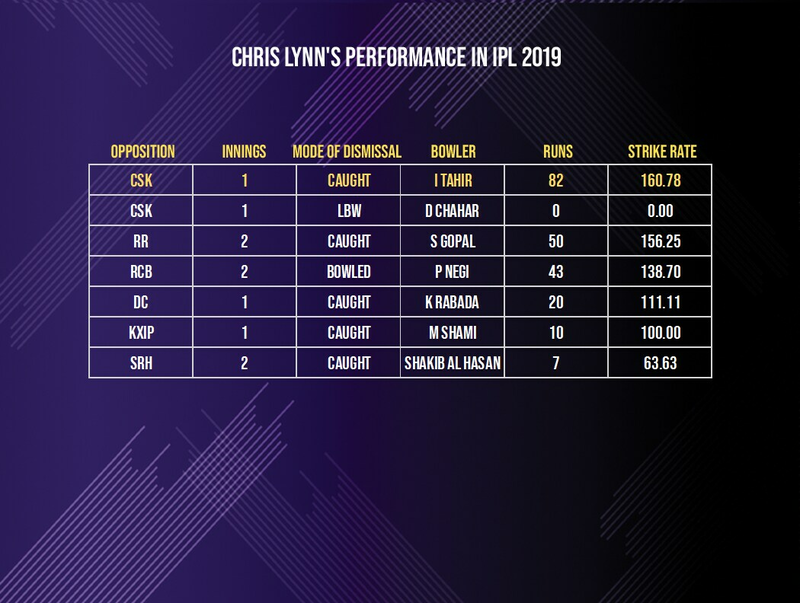 Lynn's form is crucial to Kolkata Knight Riders who have been heavily reliant on Andre Russell for the big runs this season.